For the past century, American evangelicalism has progressively adopted a theology less and less resembling the confessional dogmatism of its heritage and more and more resembling the mysticism of eastern religious tradition. Perhaps the most noticeable expression of this shift comes in the form of a practice known as “speaking in tongues”—a practice unknown to protestant denominations (other than by its New Testament reference) in the 19th century, but well known in even secular circles as a distinguishing feature of the religious right in modern times. But what is “speaking in tongues?” Is what’s happening today the same thing as what took place in the book of Acts? Is participating in this practice a sign of a “second blessing?” These, and questions similar to them surround the curious observer who rubs shoulders with the modern Charismatic or Pentecostal movements. What are Christians to make of this practice? It is the aim of this work to inform the body of Christ concerning the truth related to the practice of the important biblical gift, while at the same time warning those dazzled by the deceitful charm of its modern counterfeit. There are answers to these questions, and they are found in the pages of God’s Word. It has been said that in order to spot a counterfeit, one must first know the real thing. If there is to be an understanding of the errors of abusing, misusing, or fraudulently claiming to use the gift of biblical tongues, one must first discern the characteristics of biblical tongues. It is to this endeavor that this study focuses. Students of the Bible are first exposed to the biblical gift of tongues in Acts 2. When the day of Pentecost had come, they were all together in one place. And suddenly there came from heaven a noise like a violent rushing wind, and it filled the whole house where they were sitting. And there appeared to them tongues as of fire distributing themselves, and they rested on each one of them. And they were all filled with the Holy Spirit and began to speak with other tongues, as the Spirit was giving them utterance. Although the term “ecstatic utterances” could be a possible translation of the phrase “other tongues” (heterais glossais) , “the translation ‘different languages’ reflects the understanding of this term based on the context of Acts 2:6 and 11.” The word used in verse 6 to describe what was being heard by those listening is the Greek word “dialektos” from where modern English speakers get the word “dialect.” In verses 9-11, “the listing of specific countries and ethnic groups proves . . . that these utterances were known human languages.” While those present heard “them in their own tongues,” there were also individuals “mocking and saying, ‘They are full of sweet wine.’” In other words, the apostles and their companions were accused of being drunk. To this charge Peter responds, “these men are not drunk, as you suppose, for it is only the third hour of the day.” It is clear in Acts that the first recorded manifestation of speaking in tongues refers to known dialects spoken from the lips of rational human beings. In addition, Acts 10 records Cornelius’s household as being heard “speaking with tongues and exalting God” The content of their speech (i.e. “exalting God”) would obviously not have been known if it were not a discernable language. Paul the Apostle, in correcting the Corinthian church’s incorrect usage of the gift, rhetorically asks, “unless you utter by the tongue speech that is clear, how will it be known what is spoken? For you will be speaking into the air.” It is obvious from the only two books of the Bible (Acts and 1 Corinthians) that offer up any detail on the gift of tongues, that it can also be referred to as the “gift of languages”—specifically “human” languages. Objection: What About Angelic Languages? One modern objection to the idea that tongues was or is a human language comes from the idea that there are also “angelic languages,” separate from human language, that can somehow be spoken through the leading of the Holy Spirit. These have been referred to as part of the “religious language of Pentecostalism,” and their existence is based on 1 Corinthians 13:1 which states, “If I speak with the tongues of men and of angels, but do not have love, I have become a noisy gong or a clanging cymbal.” George E. Gardiner comments on the “angelic language” interpretation that, “Far from promoting a 'heavenly language," this verse supports the Scriptural pattern of comprehensible speech." The first thing to notice about this verse is that it doesn’t actually say that there are angelic languages that differ from human languages. Every example in scripture of an angel speaking involves a human dialect. The second thing to be aware of is the fact that 1 Cor. 13:1 is part of a long chain of hyperbolic statements. Paul asks in verse 17 of chapter 12, “If the whole body were an eye, where would the hearing be?” Obviously, it is impossible for an entire body to be an eye. In verse 2 of chapter 13 he states, “ If I have the gift of prophecy, and know all mysteries and all knowledge . . . but do not have love, I am nothing.” Even for an apostle it was impossible to “know all mysteries and knowledge.” In the next chapter the apostle expresses “Now I wish that you all spoke in tongues;” an impossibility given Paul’s previous statements in chapter 12 making it clear that not all can possess the same gifting from God. Paul’s statement that even “if” he could “speak with the tongues of men and of angels” is a statement of hyperbole and certainly not a mandate to seek or speak a heavenly languages. A third point—which removes all doubt that biblical tongues were exclusively human dialects—is that the purpose for the gifting of tongues would be impossible to fulfill if it involved anything but human languages. In short, since biblical tongues was a sign to the nation of Israel, and for the edification of the church corporately, anything but an understandable language would not fulfill the purpose of God. Objection: What About Private Prayer Languages? Surprisingly, about half of pastors believe that the gift of tongues could incorporate a “private prayer language” between an individual believer and God. The three major passages used to substantiate this view are 1 Cor. 14:2 which says, “ For one who speaks in a tongue does not speak to men but to God; for no one understands, but in his spirit he speaks mysteries,” 1 Cor 14:14, which states, “For if I pray in a tongue, my spirit prays, but my mind is unfruitful,” and Rom. 8:26 which reads, “. . . the Spirit also helps our weakness; for we do not know how to pray as we should, but the Spirit Himself intercedes for us with groanings too deep for words.” The problem with using any of these passages to forward the notion that tongues is a personal prayer language is that they each, when placed into proper context, end up disproving the very idea they are thought to prove.
. . . the Greek literally says, "But to a god." What Paul is saying is, "You people with your pagan ecstasies are not doing what all spiritual gifts were given to do, that is to speak to men. Rather, your ecstasies are speaking to a god, nobody can even understand what you're saying, you are all wrapped up in speaking pagan mysteries!" When this background is understood, the very next verse after 1 Cor:14:14 makes sense. “What is the outcome then? I will pray with the spirit and I will pray with the mind also.” Paul isn’t contradicting himself between verses 14 and 15. He is contrasting what the Corinthians should have been doing with what they actually were doing. To use verse 14 to support a “private prayer language” would be to receive Paul’s statement as an encouragement instead of a rebuke. While 1 Cor. 14 pertains to the subject of speaking in tongues, Rom. 8:26 has nothing to do with the practice. The word is not mentioned anywhere in the chapter, and even if it were referring to the gift of tongues, it most certainly is not recommending a private prayer language for two major reasons. First, it is the Spirit who is “interceding,” not the Christian. So the “groanings” are not coming from the Christian in any way, shape, or form. Secondly, it says that the groanings are “too deep for words,” or as the KJV puts it, “groanings which cannot be uttered.” Those trying to use this passage to justify uttering words from themselves to God are ignoring two major elements of the verse. God’s message of judgement upon the nation of Israel. Jehovah had plead with Israel, he had sent drought, famine, pestilence, and all without effect. The nation drifted further and further away from God, refusing His “rest” and refreshing “they would not hear.” Through Isaiah came this warning, predicting the invasion from Assyria and Israel’s resulting captivity.
. . . you shall serve your enemies whom the Lord will send against you, in hunger, in thirst, in nakedness, and in the lack of all things; and He will put an iron yoke on your neck until He has destroyed you. The Lord will bring a nation against you from afar, from the end of the earth, as the eagle swoops down, a nation whose language you shall not understand. The interesting thing about this passage is it’s reference to complete destruction (“until He has destroyed you.”) This was not something that had not taken place in either the Babylonian or Assyrian captivity. Many scholars hold the view that the final fulfillment of Deuteronomy 28 took place in “70 A.D. when Israel was conquered by Titus and his Roman legions” when the nation was destroyed. In pondering such passages, the question naturally arises, “What does Paul’s reference to the physical destruction of Israel have to do with the sign of speaking in tongues?” As the name implies, a sign is meant to point to something. In the New Testament, Christ and the Apostles authenticated their teaching through the use of miraculous “sign gifts.” On the day of Pentecost Peter proclaims, “Men of Israel, listen to these words: Jesus the Nazarene, a man attested to you by God with miracles and wonders and signs which God performed through Him in your midst, just as you yourselves know.” The signs of a “true apostle” were the performance of “signs and wonders and miracles.” The gift of tongues was a sign of the new covenant, just as other miraculous signs such as healing and miracles were. 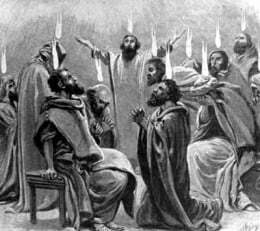 However, the gift of tongues foreshadowed a certain aspect of the new covenant. Verse 21 indicates that through the audible proclamation of truth through gentile languages, God would prove that the nation of Israel had no interest in the truth about Him. The gospel had gone to the gentiles, and they were now authorized to carry God’s message without first being proselytized into Judaism. Therefore, the purpose of tongues as a spiritual gift, in addition to edifying the church, was to act as a sign of judgement upon the nation of Israel: a judgement that would find its consummation in 70 A.D. If anyone speaks in a tongue [true gift of biblical tongues], it should be by two or at the most three, and each in turn, and one must interpret; but if there is no interpreter, he must keep silent in the church; and let him speak to himself and to God. What Paul found lacking from the church at Corinth was a sense of decency and order. More than one person was simultaneously attempting to exercise the gift of tongues in a way in which, though an unbelieving Jewish person may have been present, the church as a whole was not being edified. The gift of tongues was no more for private edification than its counterpart, the gift of prophecy, or any spiritual gift mentioned in 1 Cor. 12-14 for that matter. This is why not one command exists in all of the New Testament for individuals to practice the gift of tongues as a means of prayer or self-edification. While it has been a fundamental assumption of this study that the gift of biblical tongues was in fact a spiritual gift, there are a great many implications to this truth. Like all spiritual gifts, tongues were meant for the edification of the church. In addition however, it should be noted that tongues were only exclusive to individuals who possessed the gift, and were on par with every other gifting of the Spirit. This is the point of chapter 12 of 1 Corinthians. “Now there are varieties of gifts . . . but the same God who works all things in all persons.” It is clear that individuals are not able to choose the gifts God has given them, rather it is God who gives specific gifts to individual believers. Verse 11 of chapter 12 reiterates, “But one and the same Spirit works all these things, distributing to each one individually just as He wills.” This means that not every person possesses every spiritual gift. Even so, the Apostle makes it clear that there should be no jealousy in the congregation over what gifts each person possesses since all gifts are necessary for the proper functioning of the body of Christ. This is the idea behind the analogy of the body. “For even as the body is one and yet has many members, and all the members of the body, though they are many, are one body, so also is Christ. . . If the foot says, ‘Because I am not a hand, I am not a part of the body,’ it is not for this reason any the less a part of the body.” The gift of tongues is not superior to any other gift, and it cannot be sought by an individual Christian. It was either something God gifted a believer with, or He didn’t. Yes, it is true in 1 Cor. 14:5 Paul states, “Now I wish that you all spoke in tongues,” referring to the legitimate biblical gift. You’ll also find that in 1 Cor. 7:7 Paul wishes that all men were single. Surely Paul didn’t in actuality envision a world without marriage! What we find in 1 Corinthians, as stated formerly, are many hyperbolic statements. Paul’s statement of personal desire should not be confused with his statements on God’s desire for each believer to be uniquely gifted. Objection: What About Paul’s Desire For Christians to Pursue the Greater Gifts? In 1 Cor. 12:31 Paul instructs, “But earnestly desire the greater gifts. And I show you a still more excellent way.” This “excellent way,” as the reader finds out, is the attitude of love a believer should have for his fellow believer as taught in chapter 13. Paul was essentially rebuking the Corinthian church for not possessing this love, and as the context of chapter 12 bears out, competing with each other to gain what the Corinthians considered to be “superior gifts,” especially tongues. Paul’s statement should not be interpreted as a command, but rather as a statement of fact. “You are desiring the greater gifts.” Alan F. Johnson writes in his commentary, “The grammatical form Paul uses can mean either an imperative command, as in the NIV, or an indicative statement, ‘Now you are eagerly desiring the greater gifts.’ Only the context can help us decide between the two readings.” Therefore, according to the context, Paul is not commanding believer’s to pursue the supposedly “greater gifts,”but rather to not pursue them and choose to love one another instead. While there is no scripture that explicitly states, “The gift of tongues will end at such and such a time,” there is enough evidence within the Bible and history to cast serious doubt on the existence of the spiritual gift today. There exist three major pieces of evidence for claiming that the gift of tongues has ceased. The first is that 1 Cor 13:8 says it will cease, the second is that historically the gift ceased during the early church period (only to supposedly be reignited at the turn of the 20th century), and the third piece of evidence is that the purpose of the gift has been accomplished. 1 Cor. 13:8 states, “Love never fails; but if there are gifts of prophecy, they will be done away; if there are tongues, they will cease; if there is knowledge, it will be done away.” The first thing to notice about this passage is that the term “done away” is used to describe the gifts of prophecy and knowledge, but the term “cease” is used to describe the eventual cessation of tongues. Verses 9-12 make it crystal clear that the gifts of prophecy and knowledge are done away when “the perfect comes.” It is at this time when the “partial” gifts of prophecy and knowledge end. Paul uses the analogy of a child becoming an adult in verse 11 to explain this transition. Many scholars think the “perfect” refers to the second coming of Christ due to the statement that we shall see it “face to face,” suggesting a personal being. However, no matter what happens to prophecy and knowledge, something different happens to tongues. In verse 8, prophecies and knowledge "shall be done away with" (katargethesetai, passive voice), but tongues "shall cease" (pausontai, middle voice). The significance of the middle voice in regard to tongues is, anti-Pentecostals state, that this means tongues will act upon themselves, i.e., cease without the action of the "perfect thing." Essentially, the coming of the “perfect” brings an end to the gifts of prophecy and knowledge, but tongues ceases all by itself. It is reasonable to assume, based on the next two pieces of evidence, that this cessation occurred fairly soon after the writing of 1 Corinthians. As highlighted previously, the purpose of biblical tongues was to be a sign of judgement on unbelieving Israel. It acted as a transitional gift that pointed away from the Old Covenant and to the New Covenant. When judgement finally came to Israel in 70 A.D. with the destruction of the temple, the need for the sign of this judgement (tongues) was rendered obsolete. The nation of Israel had been judged as predicted by Jesus in Matt. 24:2, and there was no need to further point to a judgement that had already occurred. After examining the testimony of the early Christian leaders whose ministry represents practically every area of the Roman Empire from approximately A.D. 100 to 400, it appears that the miraculous gifts of the first century died out and were no longer needed to establish Christianity. Furthermore, it is very evident that even if the gift were in existence, in spite of all the testimony to the contrary, it was neither widespread nor the normal Christian experience. The only clear reference to anything resembling the phenomena is connected with the heretic Montanus and those influenced by his erroneous views of the Spirit. All of the evidence points to the truth of Paul’s prophecy when he says “tongues shall cease” (I Cor. 13:8). It wasn’t until the year A.D. 1901 that Charles Parham, founder of Bethel Bible School in Topeka Kansas, claimed that one of his students, Agnes Ozman, had received the gift of tongues (baptism of the Holy Spirit), thus launching the modern Pentecostal movement. Approximately 1831 years of silence separate the biblical gift from the modern phenomena. The chart below illustrates the historical argument for the cessation of biblical tongues. In order to evaluate the modern phenomena of speaking in tongues, one must first look to the biblical framework as a sieve. Only interpretable human languages used to edify the church corporately in the presence of unbelieving Jew(s) in an orderly setting would even begin to qualify as the biblical gift described in Acts. It is unquestionable from both the biblical and historical records that what is taking place in modern times bears little significance to what took place in biblical times. It is more likely that the modern movement is repeating the mistake of the Corinthians all over again—placing a greater premium on tongues than other gifts, doing so in confusing settings with more than one person speaking at a time, not conforming to standard human languages, and not exercising the gift as a sign of judgement upon Israel.